The creators behind Cheeky Chompers are Amy and Julie - two 'mumpreneurs' who started Cheeky Chompers while they were on maternity leave with their first children. The Neckerchew was born after lots of catch-ups with friends - where Amy and Julie witnessed countless dropped, dirty and lost teethers. Not to mention a gaggle of dribbling babies! Sometimes the simplest ideas really are the best: if the teether won't stay put, why not attach it to the baby? Over nine months of long nights they put that little thought into action. 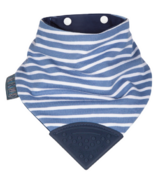 Amy and Julie designed the bibs, sourced the best fabrics and materials, tested everything for safety and quality - and even found a brilliant manufacturer right in the UK where they live. After all that, Neckerchew finally hit the shelves in 2013. Since then, Amy and Julie have put their brains together to expand the Cheeky Chompers product range to include a variety of teething aids, blankets and comforters, including the Comfortchew (launched in 2014), and newly launched Chewy the teething hippo and the Cheeky Blanket. Amy and Julie hope your baby loves the Cheeky Chomper products as much as their babies do! We?re Amy and Julie ? two 'mumpreneurs' who started Cheeky Chompers while we were on maternity leave with our first children. The Neckerchew was born after lots of catch-ups with friends ? where we witnessed countless dropped, dirty and lost teethers. Not to mention a gaggle of dribbling babies! Sometimes the simplest ideas really are the best: if the teether won?t stay put, why not attach it to the baby? Over nine months of long nights we put that little thought into action. 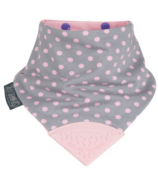 We designed our bibs, sourced the best fabrics and materials, tested everything for safety and quality ? and even found a brilliant manufacturer right here in the UK. After all that, Neckerchew finally hit the shelves in 2013. Since then, we?ve put our brains together to expand our product range to include a variety of teething aids, blankets and comforters, including the Comfortchew (launched in 2014), and newly launched Chewy the teething hippo and the Cheeky Blanket.